As we move into the new year, it is perhaps appropriate to reflect on the significant actions and developments that occurred in 2017 in the arena of climate change, both globally and nationally, and do some crystal-ball-gazing into the future. In my view, there has been a significant number of positive developments and successes that the world has achieved in tackling the challenge of climate change during 2017. I will start with the global level in terms of the implementation of the historic Paris Agreement on climate change and then the national level in Bangladesh. The first development was the way that the rest of the world reacted to the withdrawal by President Donald Trump from the Paris Agreement. Such a move by the president of the United States of America at any time in the past would have scuppered the agreement. However, in 2017, not only did no other country leave the Paris Agreement, but China stepped up to take on the mantle of leadership by reiterating its commitment towards implementing the agreement. Furthermore, France and Europe also agreed to make up the finance that the US was supposed to have provided to the USD 100 billion a year from 2020 onwards, promised by the developed countries to help developing countries tackle climate change through both mitigation as well as adaptation through the Green Climate Fund (GCF). A second aspect related to the Trump withdrawal was how Americans stepped up to “remain” in the Agreement in defiance of their president. From the Governor of California to the Mayor of New York to the heads of companies like Walmart and Tesla, many actors in the US have vowed to fulfil the commitments made by President Obama in Paris in 2015. The third and perhaps even more significant achievement was that renewable energy like solar and wind has become cheaper than fossil fuels and the development of battery technology to store energy enabled renewable energy to be delivered on a large scale, which was not the case before. One manifestation of this development is the fact that even Republican Governors of some States in the US have been investing in large-scale utility-level renewable energy supply while ignoring coal, despite Trump's incentives for using more coal. As a result, these market forces have already driven the US to be well on track to meet Obama's commitment under the Paris Agreement. Another manifestation is the way that vehicles using batteries are set to replace petrol-driven vehicles in the road transport sector globally within a decade. As a result, every major vehicle manufacturer in the world is actively making battery-based vehicles. The fourth development is a very significant one for vulnerable countries like Bangladesh, which is the scientifically unambiguous attribution of the fact that severe climate impacts, including the hurricanes in the Caribbean, the floods in South Asia, the wildfires in California, and the heatwave in Australia are indeed connected to human-induced climate change. Indeed, even the severe cold weather being felt by the people in North Eastern America this week is also attributable to anthropogenic interference in the global climate. It is important to note that these severe weather events would have happened even without climate change, but their severity and intensity was enhanced because of anthropogenic climate change (and hence they became more destructive than they would have been without climate change). Finally, at the national level in Bangladesh, we have also achieved several successes in 2017. The first one is the high-level prioritisation by Prime Minister Sheikh Hasina, the government and the Planning Commission towards implementing the 17 Sustainable Development Goals (SDGs) across the different ministries of the government. SDG Goal 13, which is on climate change, is effectively equivalent to implementing the Paris Agreement. 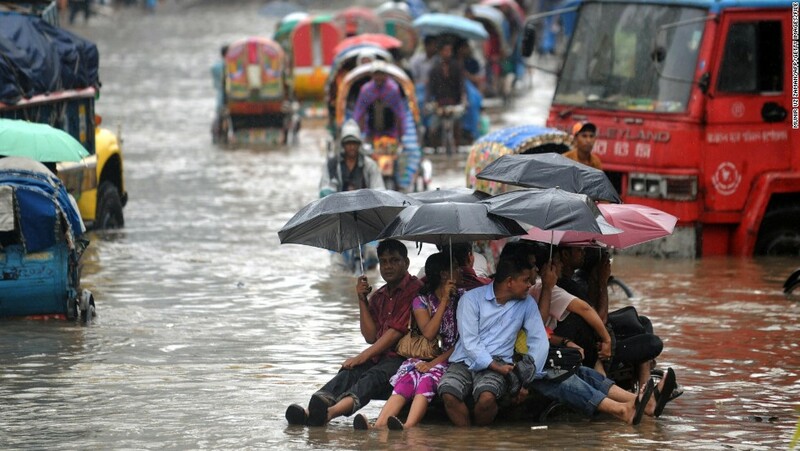 Hence Bangladesh has put the highest political importance on implementing the Paris Agreement on climate change along with attaining the other SDGs by 2030. The second achievement is the accreditation of two Bangladeshi institutions, namely the Palli Karma-Sahayak Foundation (PKSF) and Infrastructure Development Company Limited (IDCOL), which makes them eligible to access climate finance from the GCF. This is a significant achievement for which both the institutions as well as the Economic Relations Division (ERD) of the government deserve congratulations. Of course, the next challenge to actually get funds from the GCF still remains, but we can look forward to that taking place within 2018. The final development is the fact that Bangladesh has decided to officially graduate from being a Least Developed Country (LDC) within the next few years and begun to plan ways to make our economy less aid-dependent and more self-reliant. This now opens the way for the private sector to make major shifts in investment away from less environment- and people-friendly areas and towards a cleaner and greener economy. This last point is still to be reached but it is certainly within reach within a few years.